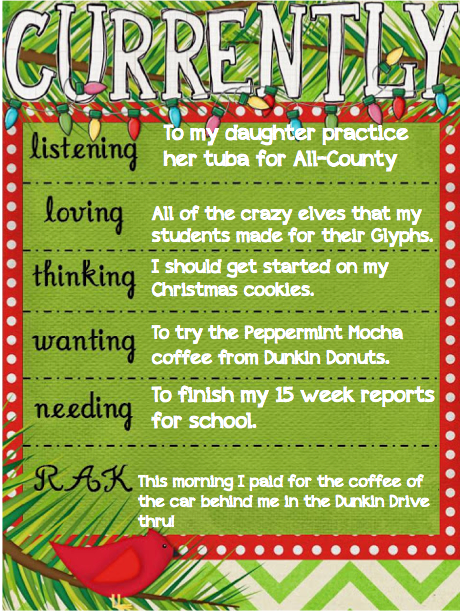 It's the beginning of December and I'm linking up again with Farley for CURRENTLY!! My daughter is a middle school Tuba master.. hee hee that makes me laugh. Who woulda thunk my little sporty girl would love playing her tuba! I can't wait for her Christmas concert next week. Doesn't it always feel like December is soooooo crazy busy? My kids have THREE concerts next week! When will I ever have time to bake cookies! I found a new recipe too... for S'mores cookies! I can't wait to try them. My little man has a peanut/tree nut allergy so he doesn't hardly ever eat cookies. But I found a sweet little company started by a mom who has a little man of her own with a peanut allergy and she sells chocolate chips that are completly nut free!... You cannot even imagine my glee and excitement over this! I can barely contain myself. Last.. Did I mention my love of Dunkin Donuts? maybe I'm a little obsessed... anyhoo.. I am really excited to try their Peppermint Mocha coffee... its' on my to-do list for Friday afternoon while I have to wait for my daughter at an appointment. Since I already seem to spend a lot of time in the Dunkin Drive thru I paid for the order of the car behind me... and that's my RAK for the month. Don't forget to head on over to see Farley at "Oh Boy Third Grade" and link up! Be sure to check out the Currently's before and after you and leave the peeps a little LOVE. 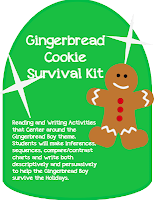 AND.... since you bothered to read all the way to the bottom of this post today.. don't forget that I am having a giveaway of my Gingerbread Cookie Survival Kit. 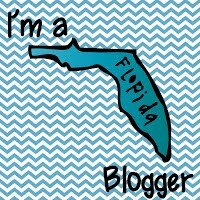 If you follow my blog and leave me a comment.. I'll be choosing a winner on FRIDAY! You can check out the post here and the item at my TpT store! Happy Blogging to all and to all a Goodnight! I can't wait to make our Elves! I feel like I have so many craftivities I want to do in the next 11 days, I'm afraid that I won't get them all done! I feel so behind this year! 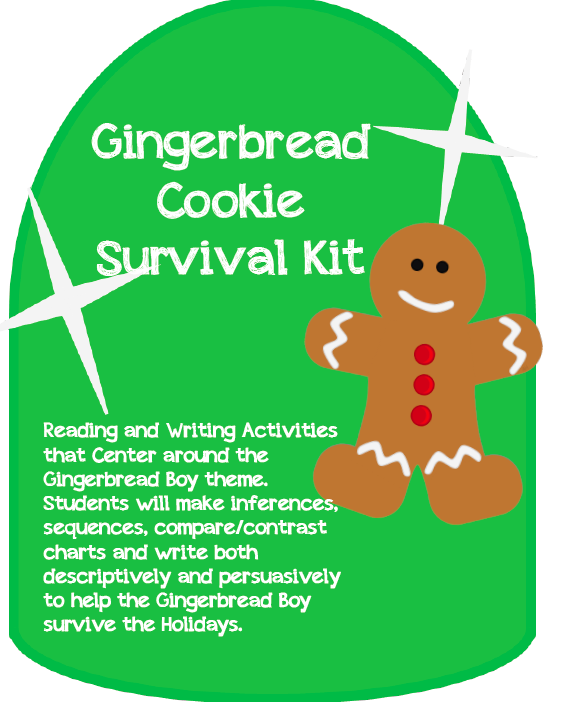 I haven't started any Christmas crafts or art projects with my class. I have pinned a ton of cute ideas, now I just need to get going on completing them. Don't you LOVE Pinterest for that! I have seen so many neat things! Thanks for sharing! I found you on the December Currently! I wish we had Dunkin Donuts where I live!!! I'm not sure I could survive without Dunkin! Thanks for coming by my blog. Didn't Honey Bunch do a great job on the design?? I can't wait to see your new design...I was so anxious too!! It's worth the wait. Reading your Currently we have a lot in common. My son is in 6th and he plays trumpet and trombone. He, too, is starting the All County band practice. I LOVE peppermint mocha coffee...Starbucks makes a good one. I need to get started on Christmas cookies. I make cut outs and Toll House! There was a linky party I was in where we shared recipes for the holidays! I bet you could still link up. 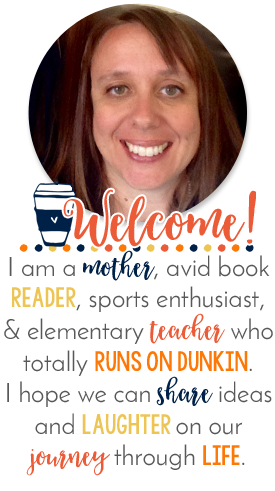 I love reading blogs from all grade levels because I do learn something from everyone. Glad to be following you! !